Giclée (pronounced zhee-clay) printmaking offers one of the highest degrees of accuracy and permanency for the production of museum quality limited edition prints. Giclée digital technology utilizes a continuous spray of fine ink droplets, resulting in accuracy of detail, superior color density and luminosity in reproducing original artwork. 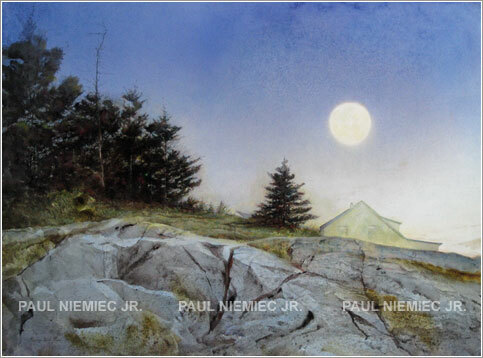 Giclée prints of Niemiec original paintings are printed on acid-free, neutral pH, 100% rag paper of substantial weight using fade-resistant inks tested for long-term lightfastness. Each print is individually inspected, signed and numbered by the artist and presented with a Certificate of Authenticity verifying edition size and quality. We recommend that you treat your limited edition print the same as any original watercolor. Giclées should be mounted behind glass, using mats or spacers to keep the print from touching the glass. Optimal framing includes the use of acid-free materials and UV protective museum glass. Your print should be protected from water and should not be displayed in direct sunlight.